I picked Risotto Primavera as this week’s EFF recipe. Primavera means the season of Spring in Italian, but in food language it usually means lots of vegetables. For those of you not familiar, risotto is an Italian rice dish, commonly seen in higher end restaurants. It originates from Northern Italy and is a creamy, luxurious dish. There are about as many types of risotto as there are stars in the sky. You can pretty much use the basic recipe and then go from there. I will add suggestions and ideas as we go. I can also promise you that this will not be the last risotto you see from me. Risotto and where you can go with it has become a staple here at the Brady compound. It’s creamy, it’s rich, and it’s comforting. It can be cheesy, brimming with freshness, or meaty. And it can be all of that and more at once. Except for the vegetables listed, this is a basic risotto recipe. You may notice I just put three cups of “vegetables” for Risotto Primavera. I did this because I want to challenge you to find your own great flavor combination! I have ideas & suggestions, but really anything goes. In fact, that’s all recipes really are – jumping off points. If you veer off the path to do your own thing, I promise you won’t get arrested by the cooking police. Creativity is the part that takes the chore out of cooking and replaces it with fun. Whatever flavor or anticipation gets you more willing to try something new, go for it! Plus if you add enough veg it becomes a one pot meal – SCORE! Arborio is the traditional rice used in risotto. It’s short grain rice filled with starches waiting to be released. It’s also the traditional rice used in paella. Although risotto is known for its creaminess, there is no cream in risotto. All that creamy goodness comes from the cooking method we’ll be using to call those starches out. Don’t buy any risotto “rice-a-roni” boxes. Just get Arborio. You can find it cheap at Trader Joe’s but it’s only a 2 cup box. I personally like to just spend the ten bucks and buy the big container at the grocery store. I like to add a little olive oil because of its high cooking temperature. You can totally omit the butter if you like. I like to use it as it is a traditional ingredient. This is going to flavor the rice as well as cook it. If you were adding seafood you could use fish stock. A good rule with cooking with wine is to use a wine you would actually drink. Traditional risotto is cooked with white wine. I like to use Pino Grigio because it’s clean, fresh and not too sweet. Wine is a perfect example of how quality can, but doesn’t necessarily, mean more expensive. If you aren’t a wine drinker and have no idea how to pick out a wine for this, you can find Gallo of Sonoma for around $6 at almost any grocery store and it is excellent to drink and cook with. Trader Joe’s also has a huge selection for very little money. Shallots are like smaller onions. They are kind of purple, and although stronger flavor than an onion, much less bite. If you don’t have shallots any small onion will do. This is the REAL parmesan cheese. It is more expensive, but the flavor blows all imitations out of the water. You can tell a chunk at the store is genuine from the rind, which will bear its name. Trader Joe’s and Costco have the cheapest prices. You can buy it already grated at both stores. Just look to make sure it says Parmigianino Reggiano. If it is the real deal, imported from Italy, the packaging will brag about it. I used broccoli and asparagus today. I just steamed them but I love to put grilled veggies on this. This recipe is a great way to use up leftover veggies too. I am a little annoyed at myself because I had some sweet peppers I was going to sauté into the risotto but I forgot them. They would have added beautiful color & flavor. I am mentioning this because I am not a perfect cook either! I forget things and make mistakes. Instead of using a different recipe for this blog post, I decided to walk my talk to use the dish I felt was not so perfect, because it was incredibly delicious! Pour stock into a sauce pan and heat on medium low. If it comes to a boil, reduce to low. What we are doing here is warming the rice’s cooking liquid so it will be warm going onto the warm rice. This will eliminate any waiting period in getting them both to the same temperature. I love to steep the broth in all kind of things – lemon peels (just put them straight in and it will release all the essential oils), lemon juice, fresh herbs (no chopping just toss them in, sticks and all, and filter them out when ladling), spices, etc. In a large skillet, melt 1 tablespoon of the butter and all the olive oil over low heat. We are using the butter for richness and because it is traditional to risotto. We are adding olive oil for its high burning temp. I love the combo of butter & olive oil. Chop up shallots and add to pan. Sprinkle with salt. Let them soften a couple of minutes until translucent. You can finely mince the shallots or be lazy like me and just slice ringlets. Shallots are so delicate; bigger chunks won’t hurt this dish. The object here is “sweating”. We are getting the shallots soft and translucent but not browning them. It is a basic flavor-base technique. Peel and chop garlic and add to pan. Give it a stir then add rice. Sprinkle with salt and pepper. Gently toast the rice over medium heat until butter and oil is absorbed – about 1 minute. You want to add the garlic right before you add the rice because garlic burns easily. Putting it in earlier means a greater risk of getting that burnt garlic taste which is very bitter. You can actually add as much or as little garlic as you like. The finer you chop it the more intense the flavor. What we are doing with the rice is toasting it gently. This increases the flavor and as they absorb the oil & butter we are waking up those yummy creamy starches that we want the rice to release. Add the wine to the skillet. Raise heat to high for one minute, then lower. On medium-high heat, stirring constantly, stir until the wine is completely absorbed by the rice. I want to say that there is no substitute for the exact flavor the wine brings to this dish. The alcohol DOES cook out. However if you don’t have the wine or there’s some reason you can’t use it in cooking, I would add fresh lemon juice (about 2 lemons worth) for some of the same acidity effect. If you have a gas stove and are not used to cooking with alcohol, then turn the burner completely off when pouring the wine in (and then back on after) so you don’t light the pan on fire. The stirring here is very important. It is the stirring with this small amount of liquid that will release the rice’s starches. The wine (sans alcohol) will be absorbed into the rice. Once wine is absorbed, add one ladle (about ½ a cup) of stock to the rice. Stir until liquid is absorbed. Repeat this step until rice is soft, about 20 – 25 minutes. Again this is a dish that you cannot skip the stirring part. But it really doesn’t take as long as you think it will. About 20-25 minutes total. You will see the rice getting swollen with the liquid it is absorbing and notice the liquid remaining in the pan is cloudier with starch. Now once you have repeated this step a couple of times you can step away for a few minutes. Just stir in the liquid for a minute or two then you can let it absorb the rest before you add more. After about 15 minutes, do a taste test to see how soft the rice is. Sometimes you will need all your liquid, sometimes you won’t – neither is wrong. Once rice is soft, remove from heat. Stir in butter and cheese. Add vegetables and serve. The butter and cheese will add even more creaminess and thicken the rice a little more. This is an optional step, but it is risotto tradition. Just stir in your veggies or place them on top. Fresh parsley or basil would be tremendous! Serve & enjoy! PS – I have a Paella-style risotto recipe on my BradyMunch blog if you want to try other types of risotto. Thank so much for visiting me this week! I hope you try this and/or any of my recipes. And if I don’t work for you, then find someone who does. Just try to do what you can. It’s pretty hard to completely change overnight. If you are just starting out, take baby steps – eventually you will get there. Try just cooking one time a week and increase as you go. And I am always here, happy to help answer any questions you have. I have also included a printable version of this recipe here (without all my witty repartee, ha-ha!) I hope you enjoyed it enough to try it! If you have questions or comments feel free to email me at bradymunchblog@yahoo.com! 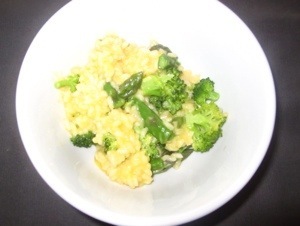 My weekly recipe on Eating For Our Futures – Risotto Primavera. Check out the rest of the EFF blog while you’re there – Adria has some great stuff!